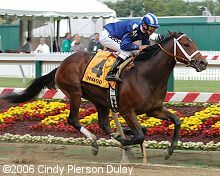 The National Thoroughbred Racing Association (NTRA), National Turf Writers Association (NTWA) and Daily Racing Form (DRF) today announced the finalists for the 2006 Eclipse Awards, voted on and presented by the three organizations in recognition of excellence in Thoroughbred racing. The Eclipse Awards are named after the great 18th-century racehorse and sire Eclipse, who began racing at age five and was undefeated in 18 starts, including eight walkovers. Eclipse sired the winners of 344 races, including three Epsom Derbies. Winners in all categories will be announced at the 36th annual Eclipse Awards ceremony, to be held Monday, January 22 at the Beverly Wilshire Four Seasons hotel in Beverly Hills, California. The three finalists for Horse of the Year will be announced just before it is presented at the conclusion of the Eclipse Awards ceremony. TVG will televise the Eclipse Awards live, with coverage beginning at 8:00 p.m. ET. Invasor seems most likely to win older male championship. Dreaming of Anna seems likely to win the 2-year-old filly championship. 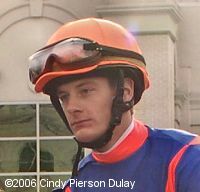 Julien Leparoux won grade 1 races across the country and seems likely to take the Apprentice Jockey title. Below are the finalists in alphabetical order with a link to a profile and photo for each equine finalist and to a bio for each of the human finalists. Polls for you to vote for your choice are available here.